Prepare this refreshing Under-the-Sea Salad. Lime gelatin, cream cheese, pears and cinnamon make this Under-the-Sea Salad both pretty and delicious. Drain pears, reserving 3/4 cup of the syrup. Dice pears; set aside. Stir boiling water into gelatin and salt in medium bowl at least 2 minutes until completely dissolved. Stir in reserved syrup and lemon juice. Pour 1-1/4 cups gelatin mixture into 8x4-inch loaf pan or 4-cup mold sprayed with cooking spray. Refrigerate about 1 hour or until set but not firm (should stick to finger when touched and should mound). 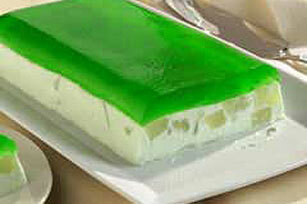 Beat remaining gelatin mixture gradually into cream cheese until smooth. Stir in pears and cinnamon. Spoon over clear gelatin in pan. Refrigerate 4 hours or until firm. Unmold. Cut into 8 slices. Store leftover gelatin mold in refrigerator. Garnish with crisp salad greens and additional pears, if desired. Prepare as directed doubling all ingredients and using 9x5-inch loaf pan. Prepare as directed, except substitute PHILADELPHIA Neufchatel Cheese.